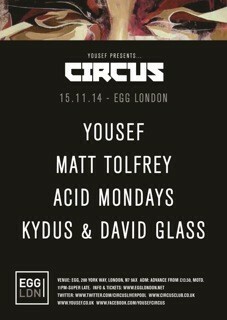 Yousef has been drawing in crowds to his Circus parties for over a decade now and this time the Circus boss is joined by Matt Tolfrey and Acid Mondays to celebrate a huge show at EGG London. Leftroom label boss Matt is welcomed to what should be another big chapter in the Circus party series. Tolfrey’s experimental blend of house and techno has deservedly cemented him in Resident Advisor’s Top 100 DJ poll for the past several years. With a monumental career that has seen the British born DJ hold residencies at some of the world’s most famous clubs such as The Verboten, Matt is one one to watch on 15 November. Making their name on the international scene over the last two years, DJ duo, Acid Mondays have had a string of notable releases. Their debut EPs, released on ‘Illusion Recordings’ in 2013, have been recognised and praised by the likes of Tini, DJ Sneak and Yousef. 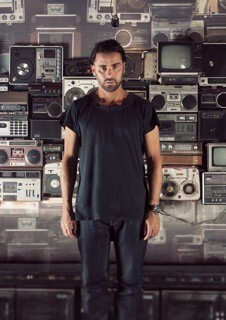 Their sound is mind-altering techno and hallucinogenic house, and should prove popular on the night. Circus Recordings family member and emerging Ibiza name, Kydus, will also be playing, just days before his forthcoming EP ‘Free Spirit’ drops on the label. The release has been going down a storm with Yousef dropping it to crowds across the globe, marking yet another success on the Circus imprint for the young talent.